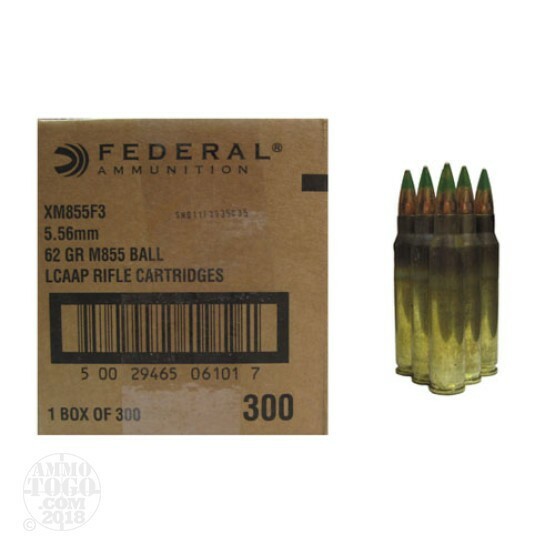 This package contains 300 rounds of Federal Lake City XM855 5.56x45mm NATO ammunition. Each round is loaded with a 62 grain full metal jacket (FMJ) projectile. This M855 Penetrator Ammo features a steel tipped penetrating core designed specifically for combat use. These rounds feature the standard green paint used to designate penetrator tip ammunition. Guaranteed to provide the precision accuracy and deadly force needed for duty, each round produces a muzzle velocity of 3025 feet per second and 1767 foot pounds of muzzle energy. This ammunition is factory fresh from Federal Lake CIty and features non-corrosive boxer primers and reloadable brass casings. This ammunition comes packed in 300-round loose packed cases. While 5.56x45mm NATO ammunition will fit in a .223 Remington chamber, the 5.56 is a military-specific round. These rounds run at higher pressures than standard .223 ammo and is not recommended for firearms with .223 Remington chambers.